Last year, I celebrated Halloween with a batch of Vampire Cupcakes. The cupcakes were filled with a gooey, thick cherry pie filling that made the cupcake look like it was bleeding when you bit into it. I planned on baking more this year, but couldn’t help but wonder if I could take the concept in another direction to make another Halloween treat to complement it. I started by thinking of replacements for the oozy blood filling and came up with the idea to put a bright-green slime filling inside. After all, what could be oozier than slime? I started out by making a batch of lime curd and using food coloring to give it a very bright green color, as lime curd on its own tends to be a fairly pale yellow. The curd needs to be made before the cupcakes so that it has time to cool and set up in the refrigerator before you use it. I think that lime is an appropriate slime flavor, but you could certainly dye lemon curd bright green, as well. I used vanilla cupcakes as a base, hollowing them out via my usual method for filling cupcakes once they had cooled. The cupcakes were moist and not too sweet, which meant that the cake didn’t detract from the tartness of the filling, just balanced it out. I used a spoon to drop a dollop of lime “slime” into each hollow, as the curd flows much better than your average cream filling and does not need to be piped in. I dyed vanilla frosting a light green to finish the cakes. 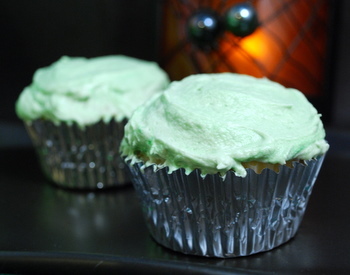 You don’t have to dye the frosting green for these cupcakes, of course, although I think that the green adds to the general swampiness of the cupcakes and makes them look a little more Halloween-appropriate than a plain white frosting would. If anything, I would experiment with different colors of frosting, like black or brown. You can buy black dye at baking/craft stores, but adding in some red or blue with the green can give the color a darker tone. Chocolate frosting would not be a great choice because the flavor could overwhelm the slime filling, even though it would give a nice earthy look to the cake. In a small sauce pan, over medium heat, dissolve sugar into lime juice. Lightly beat eggs in a small/medium bowl. Whisking constantly, slowly trickle hot lime/sugar syrup into the eggs. Beat for about 1 minute, until well combined, then transfer back into the saucepan. Cook over medium heat, stirring frequently, until curd starts to bubble and is thick. Stir in the food coloring while the curd is cooking. Remove from heat and transfer to a heatproof bowl. Cover with plastic wrap and refrigerate until cold. In a medium bowl, whisk together cooled, melted butter, eggs, vanilla and milk. Pour into flour mixture and stir until just combined and no streaks of flour remain. (A photo how-to of the assembly method can be found here.) Take a cooled cupcake and, using a small pairing knife, cut a cone of cake (1-inch across by 1-inch deep) out of the top. Trim off the pointy end of the cone, leaving a flat circle of cake. Set aside the circle and discard (or eat) the rest of the cone. Repeat this process for all the cupcakes. 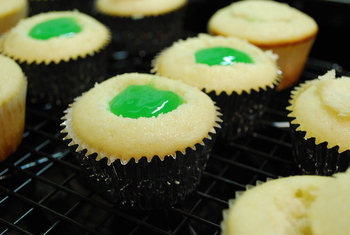 Take the slime filling and spoon about tablespoon into each cupcake cavity, filling it almost to the top with lime curd. Top off with the flat circle of cake you just removed to seal the hole and hold the â€œblack lagoonâ€ filling in place. Once all the cupcakes are filled, they can be frosted just as ordinary cupcakes. Cream butter with an electric mixer until soft. Add vanilla and gradually add in sugar until most has been incorporated. Mixture will look a bit sandy. Add in milk as necessary (start with 2 tbsp), along with any remaining sugar, until frosting reaches a thick, but easy-to-spread consistency. 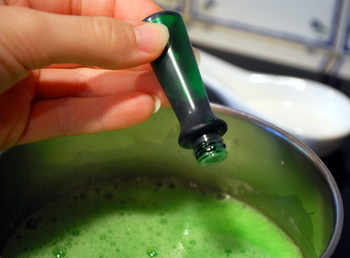 Add green food coloring until desired green color is reached. Add in a few drops of red with the green for a brownish color, or a drop or two of blue to deepen the green. I love these! Soooo perfect for Halloween! They look delish .. I want to try it but I know they will not come out like yours did! Thanks for the great idea. Maybe slime AND blood would be fun on the same table. Scary or not. Slimy or not. As long as the cupcake is vanilla, hhhhhmmmm I’ll eat that. :) Thanks for the share here. Though halloween is still far this is a good preparation. These are very spooky and delicious-looking cupcakes. ooh an idea for the Halloween Bash cakewalk! Oh yes, these cupcakes look amazing. What a great treat for halloween. You don’t have to Hollow them out. There’s tip you can get and all you have to do is insert it almost all the way into the cupcake, squeeze your filling and there you go! These are awesome! I can think of a few people who would love to bite into one of these. (Myself included.) 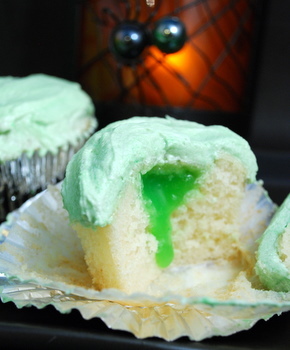 I was all over those vampire cupcakes, but there’s just something about slime, you know? 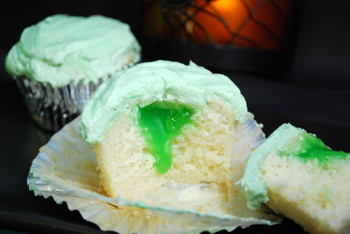 Nicole, these slimelicious cupcakes are great…and perfect for Halloween, too! Thanks for sharing them with us. We are excited to have the recipe (and photo :)) in this week’s FoodieView Recipe Roundup! What a great idea to bake at a kids’ birthday party. I love lime, and while it’s the middle of winter and not even close to halloween, I’m def. going to try these right away. I love halloween theme foods in general, and this one’s just perfect. Thank you for sharing it! What a great idea! This will be just right for halloween parties, the kids will love it! These are super cute! I bought some hot pink peeps today. I saw blue and green ones too, so I think they come in tons of colors now! I love how these cupcakes look creepy but cute at the same time! Just gorgeous! Thanks for the brilliant idea! Thanks for the adorable recipe! these cupcakes were a perfect fit for my sons teenage mutant ninja turtles birthday party.They loved the sewer slime!